Did you know it's only a two hour drive from Las Vegas to the Grand Canyon? Plan ahead to see one of the natural wonders of the world. There are lots of Grand Canyon tours from Las Vegas to choose from, including helicopter tours or tours by land. 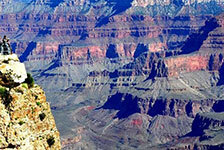 If you don't have much time, book a Grand Canyon helicopter tour which can get you there and back in under four hours. If you want a leisurely trip that includes more sightseeing and more stops, at places like the Hoover Dam, then book a driving tour. Don't pass up a chance to see the Grand Canyon on your next Vegas vacation!